Need proof that Birth to 5 services make a difference in families’ lives? How about a 13% per child, per year return on investment! Here are links to research and resources to help you broadcast the values of Birth to 5 services to your funders and your community. The Heckman team gives us all the tools we need to make the case for high quality comprehensive services. Wishing you all a nurturing summer with your families! Need proof that Birth to 5 services make a difference in children’s and families’ lives? How about a 13% per child, per year return on investment! This ROI is based on the positive long-term outcomes in education, health, social behaviors and employment achieved by high quality Birth to 5 programs. To help spread the word, the Heckman team has developed handouts and sharable graphics for all of us to broadcast the amazing long-term benefits of comprehensive Birth to 5 services. 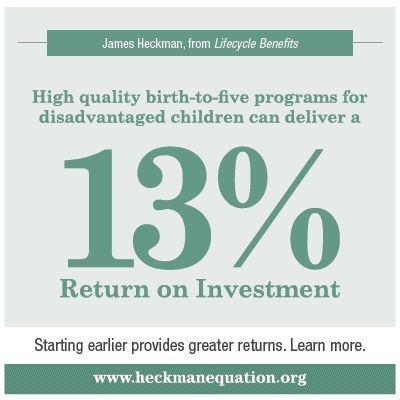 Resources of your choice are available on the HeckmanEquation.org website. You can back up your argument with findings from research summaries, FAQs, cost-benefit analyses, and academic papers. You can also download zip files of topical Toolkits on 1) health benefits, 2) the myth of educational fadeout and 3) lifecycle benefits of comprehensive early childhood programs. When touting early childhood programs, be sure to highlight your local KIPS parenting outcomes. Your KIPS data and success stories will document the valuable intermediate outcomes you are achieving to build long-term benefits for your children and families. For examples, take a look at how two Arizona PAT programs have used KIPS to highlight success with their families. Thanks for all you do to build nurturing parenting that matters to children! Where Can I Find KIPS Online Training and Supports? KIPS online training and support systems use three separate web addresses. It's a good idea to bookmark each in your browser, so you can get to them when you need them. Forgot your password? On each login page click on HELP! I forgot my password. Type in your username (usually your email address), and the program automatically sends you an email with your username and password. info on parenting practice and research. Want a FREE Annual Check-Up? a Guest Blog or Success Story with us. Contact Marilee for more info. Thanks for sharing KIPS TIPS with others! You received this email because you are subscribed to Parenting Outcomes and Services from The KIPS People - Comfort Consults.